Variations on Collecting Nursing Badges - Influence of the London Hospital. Influence of the London Hospital. Many people collect badges by themes, as written about by Will B (1). Hospital/ Place/County, Speciality, (Midwifery, Orthopaedics, General, District Nursing), G.N.C. badges and several other aspects..
Another variant could be by the Person /Hospital badge which inspired the design. For example Florence Nightingale, St Bartholomew’s, The (Royal) London, St Thomas's and so on. However, finding out how or by whom who a badge design was inspired by can be very difficult. Often this history is not written down by the makers! Even for relatively recent designs. For example a 1993 badge designed for the London and Newham and made by Thomas Fattorini. This badge has proven very difficult to find any details about its design, even from Fattorini’s, who, whilst acknowledging that the stamp on the back is theirs, have no records of the design - going back just 20 years. Oral history can disappear very quickly, and discussions about the designs are lost/not recorded initially. Sometimes League minutes (if the league instigated the design) can show discussions, whilst other more recent records may be closed to the public for research purposes. Some theories about where a particular badge came from may not be accurate, and equally hard to prove or disprove either way, even with much time spent perusing archives. 1. Top Left; St Martin's Hospital bath. 2. Middle top; Chingford Hospital, E4. 3. Top right; Kettering Hospital, Northants. 4. (Middle top, large LH Badge (circa 1930). 5. Bottom Left; Derby Children's (later version). 6. (Middle bottom; smaller LH badge (circa 1945). 7. Bottom Right; West park hospital, surrey. 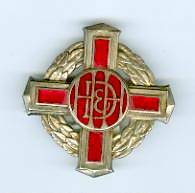 During world war 2 the London Hospital was part of Area 1 hospitals, which transferred patients out east to hospitals in Essex, this may have influenced the design of the other badges such as Chingford. One badge missing from this collection is that of Haslemere and district Hospital badge (probably the one awarded to Jennifer Meglaughlin and part of her collection). On perusing collections of photos on nursing badges on sites such as ‘schoolsofnursing’ a few more show similarities, but indeed this might be all that that is, once the issue of nursing /hospital badges became more widespread they may have been shown manufacturers patterns and merely chosen ones they prefer. Four more show strong tendencies (bearing in mind that generally blue is used, as a medical colour, the London's red cross being red because of the coat of arms of the corporation of London). 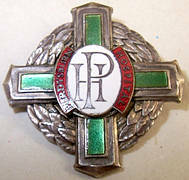 Belmont, St. Helier (with wreath), Dartford and Farnbourgh also share characteristic of the LH badge. Until 1931 Burdett's hospital year book was a useful source to a researcher as it often showed from where nurses had trained/gone to work (3), And in the case of Matrons letters at the London, in Eva Luckes day, listed to where her nurses had gone (4) ...but this still doesn't mean that the badge of their alma mater hospital had any influence on badges worn at their new places of work . Other themes in design which could be tracked are Florence Nightingale, St Thomas, Charing cross, and St Bartholomew’s (Barts). 2. 'History of the training school badge' Margaret Job, 1967. (Royal London Hospital Archives ref: RLHLH/NE/10/2). 4. "Letters to Her Nurses" Eva C A Luckes, vol 1 1896-1900 (Royal London Hospital Archives ref: RLHLH/N/7). 1. 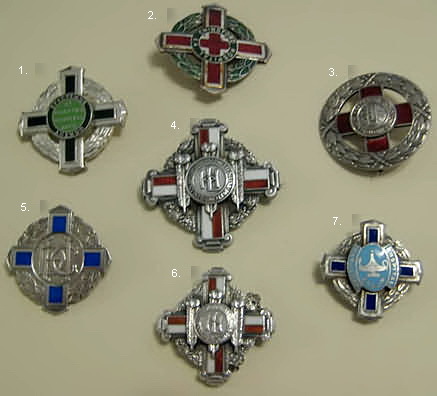 Seven badge comparisons - private Collection. 2. Haslemere & District Hospital Badge-RCN Archives. *NB ‘Multiply’ - The nursing badge photograph galleries on this site no longer exist.